“The World Champion San Francisco Giants.” I whispered it to myself. The words sounded good. It was September, 1971, I was 11 years old, and in only my second full year as a Giants fan, my team was going to the playoffs! I knew about Bobby Thomson’s home run in 1951 even though that was some years before I was born. I knew about the 1954 champions, and I knew about the 1962 Giants, the first San Francisco team to get that (achingly) close. This year, 1971, was going to be my year, the year I’d remember. That seven-game loss to the Cardinals in the 1987 NLCS was a bitter pill. So was the last day of the season elimination at Dodger Stadium in 1993, and let’s not even go there about 2002. (Right before the 2010 playoffs, Ken Burns’s “The Tenth Inning,” a P.S. to his great miniseries about the history of baseball, aired. I couldn’t even bring myself to sit and watch the part about the 2002 World Series. ) I don’t literally have bad dreams about Dusty Baker taking the ball from Russ Ortiz in Game 6, but the memory has a nightmarish quality, doesn’t it? So let’s switch to the happier stories: Joe Morgan’s home run on the last day of the 1982 season, knocking out the hated Dodgers two days after they’d knocked us out. The first day of the 1993 season, when the banner from the previous year that had said “SAVE OUR GIANTS” had been changed to “SAVED–OUR GIANTS.” (I cried and cried that day. I’m getting teary just writing about it. I didn’t cry that hard again until 2010.) 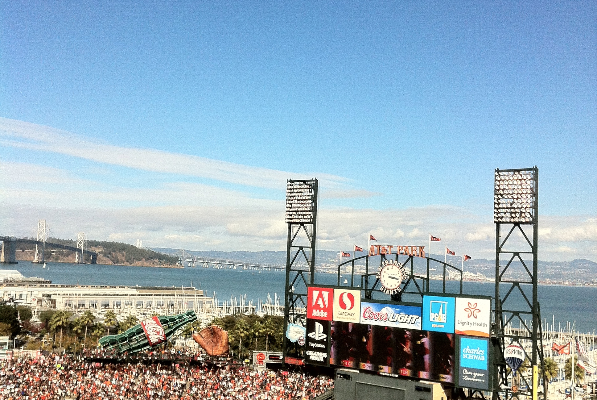 The first time I ever saw AT & T Park (then Pac Bell) in April, 2000. The most significant game I’ve ever seen in person, when the Giants won the pennant in 2002 on Kenny Lofton’s walk-off single. My family and I—our two girls were 13 and 8 at the time—had standing-room tickets and watched the game from the cable car in center field. Sitting in Section 208 with family and friends on my 50th birthday, August 1, 2010, when a packed, rocking house celebrated a three-game sweep over the Dodgers, Cain beat Kershaw, and, in great foreshadowing, Edgar Renteria was the hero. I am actually crying. I’ve waited my whole life for this. My. Whole. Life. “The World Champion San Francisco Giants.” This time I didn’t whisper it. I shouted it between sips of champagne. It took 40 years of being a fan—I went from being a 10-year old girl to a 50-year-old mother of two and college professor—but it finally happened. I know you all feel the same way about that moment that I do. But I’ve also shared that the 2012 champions have a special piece of my heart. Let me explain why. I’m not a former player or coach or manager. I’m not knowledgeable in the technical aspects of the game as many of you are. I’m a writer, and I like storylines. That 2012 season was so full of stories—the disappearance of Freddy Sanchez, the early-season injury to 2010 hero Brian Wilson, Melky Cabrera’s PEDs bust. And the triumphant return of Buster Posey from a horrible injury, of Barry Zito from humiliation, of Pablo Sandoval from his 2010 benching, of Ryan Vogelsong from obscurity—and of the whole team from the brink of oblivion, twice. I just thought of something else. That 2012 season was the first full year I shared the story with you all, on Giants Extra, from start to finish. That’s another reason why it was so special. I don’t know how this season’s story is going to end. It’s certainly been one of the strangest ones in all the years I’ve been watching. So I’ll close with the chorus from Mr. Lefty’s song. Tonight it’s beer and bourbon; tomorrow it’s a strong cup of joe.